James Carter is a former resident of Florida who now has his studio in North Carolina. He is a talented jewelry artisan who specializes in pieces using the ancient technique of Cloisonné. 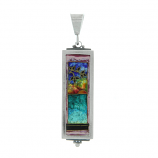 Cloisonné refers to the process of enameling using wire to separate areas of enamel. 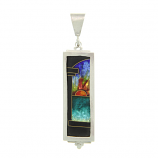 Enamel layers are painted within wire cells and fired repeatedly until the desired colors are achieved. 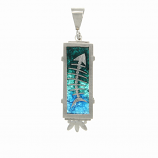 A single enamel piece may require from four to twenty layers or more. James makes his pieces using a silver palladium alloy and 24Kt gold wire. The frames are cut and soldered with a torch. The Cloisonné piece is made seperately and is set from the back with a plate bearing his signature. Each finished piece is an individual work of art. Have Questions About Our James Carter Jewelry Collection? So many "unique" and beautiful treasures!!! Like icing on the cake, when you get to bring home one of them, to remind you of your peaceful and amazing time on Sanibel.